Nunez is professor and director of the School of Education at Purdue University, Fort Wayne. She is the co-author of Worth Striking For: Why Education Policy Is Every Teacher’s Concern (Lessons from Chicago). She just wrote a piece about the teachers’ strike in Los Angeles, where she began her teaching over 20 years ago: “When Alex Caputo-Pearl was elected the president of the United Teachers of Los Angeles (UTLA) in 2014, I knew that children, families, and communities would soon have a newly energized and empowered defender in the teachers union. 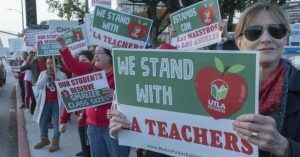 Today, as a Los Angeles native and a supporter of public schools and their teachers, I am on the edge of my office chair following the news of the first strike by L.A. Unified School District teachers in 30 years. “Caputo-Pearl’s election was part of a nationwide wave of teacher activism and movement building that hit closest to my then-home in the Chicago teachers’ strike of 2012. After witnessing a decade-plus of destructive educational policy making, teacher deskilling and disempowering, and inroads to school privatization, I felt like the Chicago teachers strike saved my life. The Chicago Teachers Union under President Karen Lewis led a united teaching force in a labor action that was supported by a majority of the residents of the city — and a bigger majority of Chicago Public School parents. The strike taught me that resistance to the neoliberal project in education is possible. … The wave of activism in teachers is not losing momentum, as evidenced by the past year’s statewide actions by teachers in West Virginia, Kentucky, Oklahoma, North Carolina, Colorado, and Arizona. Nunez is also the co-editor of Diving In: Bill Ayers and the Art of Teaching into the Contradiction.